♥ The bead is hand engraved hand in our workshop with a marking pin. ♥ So the engraving is not "mechanically straight 'but literally' hand-written 'by Tanja. ♥ The closure may hooks at each stage, so the length can be adjusted easily. ♥ The heart is approximately 11 mm wide and 12 mm high. ♥ Extra strong (!) Using solid links. ♥ All links are safe gesoldereerd, so the bracelet can not go loose. Beautiful .925 Silver Bracelet & Earrings with a symbol of Ininity: the symbol of infinite love and infinite friendship. For now and forever! Luxury finished with 13 sparkling CZ stones. Luxury wrapped in a silk pouch. 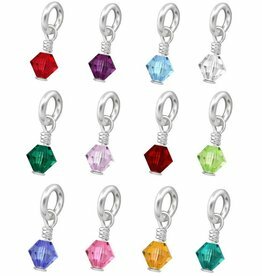 Personalize your jewelry with a birthstone of SWAROVSKI® crystal. Nice as an addition to a bracelet or necklace. 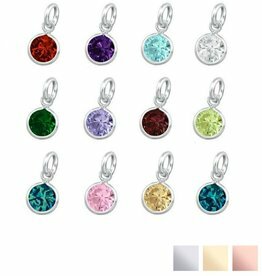 Each birth month has its own birthstone, available in 12 beautiful colors.